Casinolize is one of the few gambling outlets you see that will serve only one game. The site is flooded with mixed Bitcoin dice reviews. However, this situation will change soon. You can expect that their popular Bitcoin dice game will impress you. The company expects to release their new games such as jackpot, roulette, and crash games soon. One thing that will get you hypnotized by Casinolize is how their incredible their 0.7% house edge is. Casinolize undeniably has one of the smoothest interfaces you can see out there. You can play the online casino with ease using their instant play feature. Additionally, there is a special auto spin feature for this dice game. This is a unique feature since you will not have to worry about manually clicking the start button for betting. You can easily access their online chat service. If you have any concerns regarding the site, you can contact them via email or their online chat plugin. This factor makes them one of the best sites. You may claim 300 satoshis every time you click their Bitcoin dice faucet. In this free Bitcoin Dice game, tentatively, you can have one or two rolls, in case you run out of satoshis you will have to press the faucet again after a few minutes. Casinolize also offers 20,000 satoshis as a giveway in its Bitcointalk forum promo. To get this promo, you will be required to comment in the forum and wait for 24 hours to get the free bonus from the site. Apart from the free faucet and no deposit bonus, the company promises more bonuses and promotions to come soon. You can easily withdraw and deposit in Casinolize. You will notice that the site prioritizes their deposits. You can instantly your money online via storage wallet. 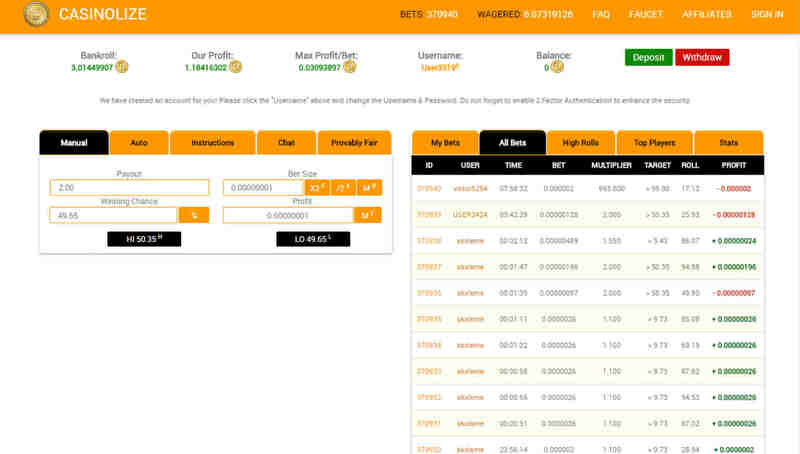 You can also withdraw quickly once you secure your payout. Despite these amazing features, the online casino, the online casino is off-chain, which means you will require to personal info in order to play. For now, the site only accepts Bitcoin. This is a good thing for you since Bitcoin is the largest cryptocurrency in the market. You can make transactions in and out of the website digitally, which is easier than processing fiat, or tangible money. For now, you are not advised yet to go all-out with your wagers in this site. However, the casino promises new features in the near future so it is recommended to look forward to the next features of this company.